Oh Bali- luscious beauty, balmy days, turquoise beaches, endless surf, kind hearted people and incredible food! What's not to love? 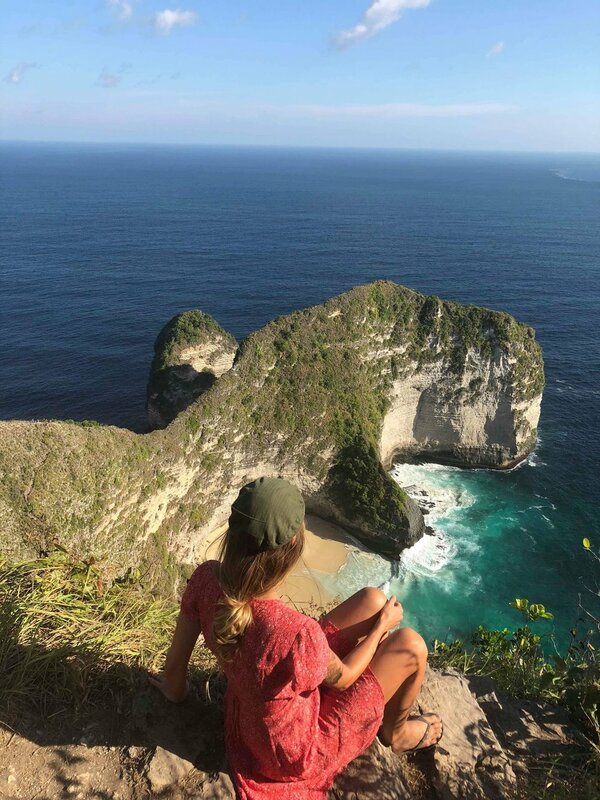 We recently went back for a wee winter getaway to explore the nearby Island's Nusa Lembongan, Nusa Ceningan and Nusa Pedina and revisited Canguu and Seminyak. 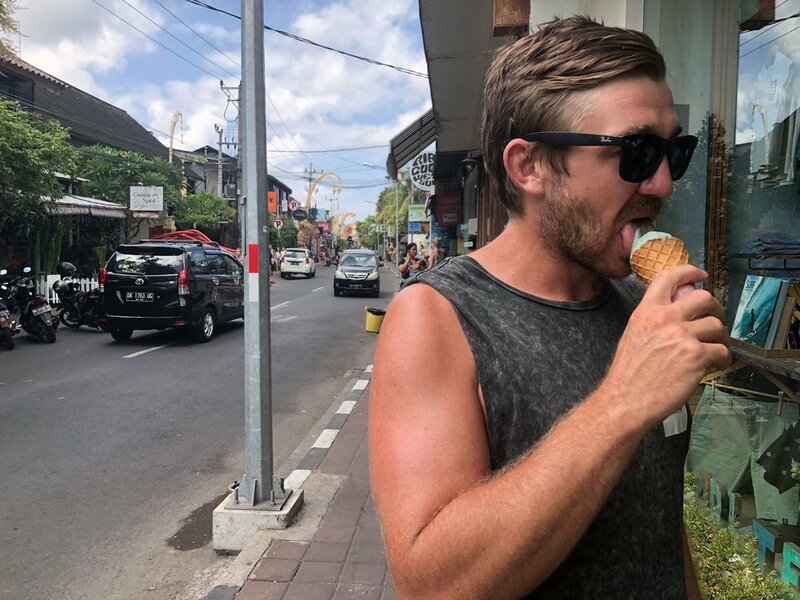 I of course couldn't help but hit all of the incredible wholefood and vegan cafes spotted all over the place and since have had a bunch of people asking for my favourite spots to check out across Bali. So here it is- my wholefood Bali food guide + some pretty photos of the nearby islands- because, well, how could you not. Kynd Community: offering an extensive and delicious fully vegan menu with smoothies, cold pressed juices and cabinet treats. This spot was our go to in Seminyak but it's super popular so its best to go early in the morning or later in the afternoon to get a good seat. Sea Circus: More of a restaurant vibe but open for lunch too and located in amongst the heaven that is Bali Boat Sheds. They have recently opened an upstairs taco and cocktail bar called Neon Palms too which, although had no gluten free items on the menu has a stunning aesthetic and a darn good cocktail. Mad Pops Bali: A wee vegan gelato joint that took me back to long balmy days in Italy. They have a delicious range of flavours, all vegan. My favourite was the roasted peanut with a scoop of triple chocolate on top. Shelter: This beautiful plant laden spot is definitely worth checking out. Along with their own menu upstairs the infamous Nalu Bowls resides downstairs to fill all of your wildest jackfruit smoothie bowl desires. Coffee Cartel: Makes a damn good coffee. They also have a few nice options on the menu although it might be worth double checking what is fully vegan and gluten free as there seemed to be a little confusion. The Tailored store: For dreamy homewares that make you seriously consider (and price out if your crazy like me) a shipping container to send home. Bali Boat Shed: In general for everything- always. Peloton Supershop: One of the longer standing and very best wholefood and vegan establishments in Bali. This place is always packed and for very good reason. Their beautiful space and extensive vegan menu is a win win and would be on the top of my list for must-go cafes. Quince: This sweet little spot has a nice menu with an attached homewares selection of swoon worthy ceramics. 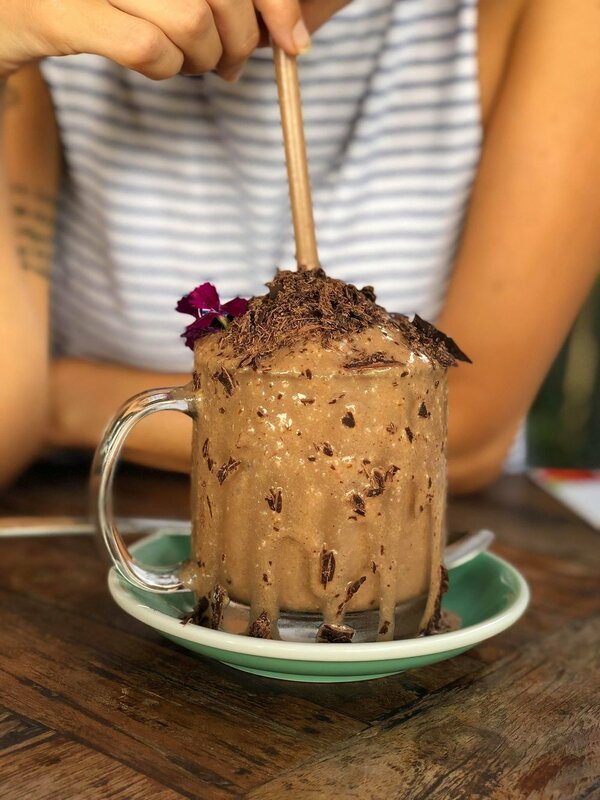 The Shady Shack: An expats favourite hang out with a good range of vegan and gluten free goodness. 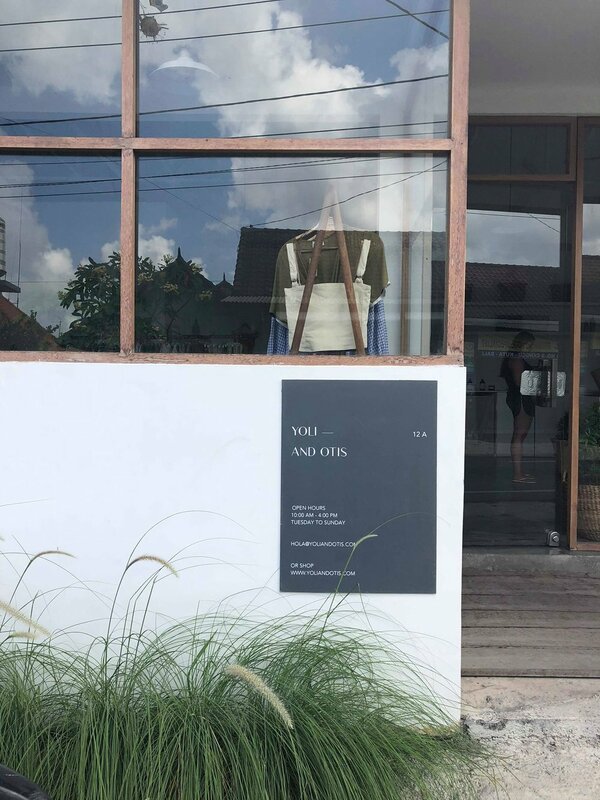 Yoli and Otis flagship Bali store: Made with organic and recycled textiles and coloured with herbal and plant dye techniques these beautiful timeless pieces are my absolute favourite. The showroom itself is something out of a dream too. Cove Essentials store: A dreamy clothing and accessories section complimented by hand picked homewares that will have you drooling all over the place- not to mention the kind of aesthetic that'll make you wish you lived right there in the shop. The Glasshouse: Offers a rather beautiful range of wholefoods in a rather beautiful setting. 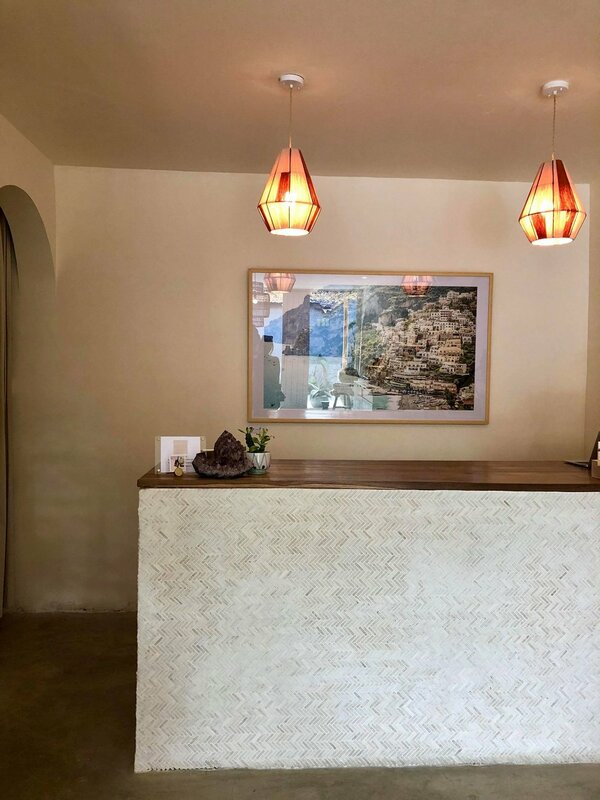 Alchemy Bali: This very Ubud-esque haven homes a killer (or not killer ha-ha) menu with raw cold pressed juices and tonics, a retail section AND a naturopathy clinic upstairs. Om Burger: Those two words make my mouth water. This divine burger joint is one of a kind and offers fun things like spiralina or charcoal burger buns just incase you want to go that extra mile. Nalu Bowls: Another site of the smoothie bowl masterpiece sitting pretty along side Single Fin surf club/bar which is home to some of the best sunsets in Bali. Pituq Cafe: Located a few blocks behind the main drag of Gilli T this adorable wholefood heaven is worth hunting out. To date the best spiced cayenne hot chocolate I have ever had. Ginger and Jamu: An island favourite for us, sitting right on the beach front. With gentle waves lapping at the shore, wriggle your toes into the sand, pet a random dog, watch the sun set and enjoy some delicious wholesome food. We absolutely love the little slice of paradise that is Waihi Beach. A casual 45 minute drive from Mount Maunganui lies unspoilt lengths of white sands and hidden leafy bays. Every-single-time we find ourselves here I immediately start dreaming of moving to this still central Coromandel-esque beach village. We often head out for a day trip, no matter the season, and hike around to the nearby beaches or grab a coffee from the adorable Secret Garden whilst never missing an opportunity to swoon over the beauty at Sunday Homestore. On this particular wintery bluebird day we hit Bowentown to wander around the hill tops and down to the hidden, yet magical Pohutakawa laden bays below. I can not wait to spend long balmy summer afternoons down here soon (soon, she wishes wistfully). We followed this up by a perfect Allpress Coffee from The Secret Garden, soaking up those rays in their beautiful hidden Balinese Gardens and checking out their range of Indonesian homewares before popping across the road to Sundays. All of this followed up by a soak in Athenree's cute-as-pie wee mineral hot-pools for, wait for it, $8 per person- happy days!